Home \ Sean’s 7 Day Core Challenge is now Live! Is there anything more satisfying and inspiring than a 7 day challenge? Well, I suppose there’s a few things but in the wild world of fitness it’s difficult to find problems with 7 days of complete workouts with a new one each day. All we do is smack that play button each day and dive into our full body workout for the day…hopefully with a steady dosage of sweat and grinning/grimacing. It all adds up to our personal fitness journey and with that in mind I’m overjoyed (over the moon!) to bring you my 7 Day Core Challenge! Here we go. Begin anytime and day you wish! Saturday – Best Pilates Core Abs Workout from HELL! 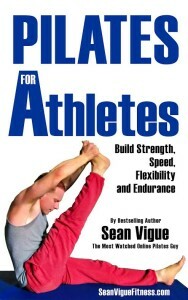 Keep your workouts and fitness programs flowing with my bestselling book Pilates for Athletes available by clicking here! Get the athlete’s secret weapon!